Know what seven of the most useful Spanish words you can learn are? Without knowing these seven simple words, how are you going to make plans to chat with your new Spanish-speaking friends, talk about the future or plan out a Spanish study routine? Learning how to say “Monday,” “Tuesday,” etc. in Spanish is an important step towards having a wide, functional vocabulary of basic words and phrases that come up frequently in conversation. Are you a beginning Spanish learner? Read on! 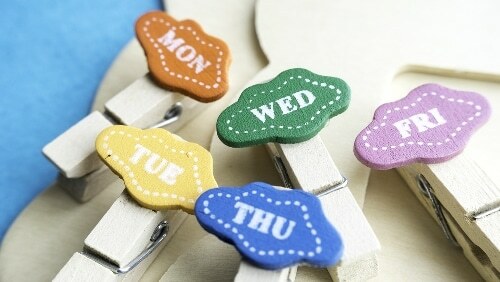 This post will not only provide you with the words for all of the Spanish days of the week. We’ll also give you some useful memorization tools, tips on how to use the days of the week in conversation and some additional helpful vocabulary. First, here they are: The Spanish days of the week. You can click on the links below for pronunciations. Since none of the days of the week are really cognates with their English equivalents, it can be difficult to remember all of them, and extremely easy to mix them up! Use the techniques below to help get the days of the week stuck in your brain, correct spelling and all. If you’re currently taking a Spanish class, this is simple—just include the day of the week when writing the date in your notebook. Even if you aren’t enrolled in a Spanish course, there are plenty of opportunities to write down the date, such as in a journal or diary, on a daily to-do list or on your class notes for other subjects. Putting the date down in writing every day will help you remember the words and their correct order. YouTube is chock-full of “days of the week” songs in Spanish. Here’s one, and here’s another. Once you get one of these songs stuck in your head (and trust me—they will get stuck in your head), remembering the order of the days will be a cinch. Yes, you may feel silly listening to children’s tunes, but if it helps you learn Spanish, it’s definitely worth it! Acronyms are a highly useful memory tool. Use the abbreviations for the days of the week in order (L, M, M, J, V, S, D) and design your own acronym to help you remember them. Here’s one off the top of my head: Little Mice Make Jolly Vikings Slam Doors. Is this sentence nonsensical and silly? Yep! But I certainly won’t forget the image of a burly Viking shrieking and slamming a door shut at the sight of a tiny mouse, and I’ll be able to use my acronym to remember the correct order of the days of the week. Feel free to use mine, or to make up a different acronym that works for you. Every time I look at my phone’s lock screen, it reminds me what day of the week it is—in Spanish! Since most of us spend a lot of time with our phones, changing your settings to make yours speak to you in Spanish can be a great way to passively practice your language skills throughout the day. Now, I see the Spanish days of the week every time I use my calendar app or look through my email inbox. Overwhelmed by the idea of having a foreign-language phone? You can always start slow by keeping your phone in English but downloading a Spanish-language calendar app. Try Calendario PocketLife for iOS. It’s a simple calendar app that you can use in Spanish without changing your phone’s language settings. One of the best ways to learn Spanish is through immersion—that is, by exposing yourself to as much authentic Spanish as you can. 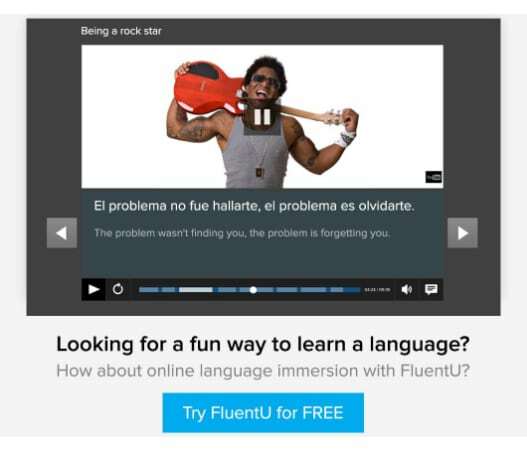 And you can do that with FluentU, which takes real-world videos—like music videos, movie trailers, news and inspiring talks—and turns them into personalized language learning lessons. 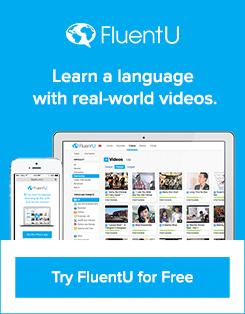 FluentU is about so much more than videos: You also get access to interactive flashcards and vocab lists, annotated subtitles and personalized quizzes that evolve as you learn. It’s an entertaining method to immerse yourself in Spanish the way native speakers really use it, while actively building your vocabulary. Check it out with a free FluentU trial! The days of the week seem pretty straightforward, but there are some important differences in usage between English and Spanish. Here are a few key things to remember when incorporating this new vocabulary into your writing and speaking. The only exception to this would be, of course, if they appear as the first word of a sentence. Not up to speed on Spanish gender? Here’s your refresher. This means that when you’re referring to a day, you must use the masculine articles el, los, un and algunos. El is a definite article, like the English word “the.” It’s used with singular nouns. In this case, use it when talking about a specific day of the week. For example, el lunes pasado (last Monday). Los is also a definite article, but we use it with plural nouns. Use it when talking about multiple days. For example, los lunes (Mondays). Un is an indefinite article, meaning it refers to a general concept of an object, rather than a specific object. It’s like the English article “a.” For example, you could say un lunes de enero (a Monday in January). To talk about multiple, undefined days of the week, use the word algunos (some). The indefinite article unos (some) also exists, but it’s not frequently used in conjunction with days of the week. To say “some Mondays,” say algunos lunes. When talking about a day of the week, you must choose the correct masculine article. Remember that if you’re describing a day of the week using an adjective, you must also use the masculine form of the adjective. Use el when talking about one single occurrence, and the plural los when talking about something that happens habitually. Viene a Madrid el lunes. Sometimes, you need to talk about days of the week in the plural, like in the previous example (todos los sábados). When making days of the week plural, only add an s if the word doesn’t already end in s. Otherwise, the word stays the same in the plural form. Now that you know the basics, here are some useful words and phrases you may want to use when talking about the days of the week. Don’t get confused—in Spanish, mañana means “morning” but it also means “tomorrow.” It all depends on context! Note that in this case, we must use the past tense verb fue (was) instead of es because we’re talking in the past tense. Although día ends in an a, it’s actually a masculine noun. La fecha generally refers to the day of the week as well as the number of the day and the month. Use el próximo plus a date to talk about an upcoming day of the week. Note how we always use the masculine form próximo because the days of the week are masculine. ¡El próximo lunes es mi cumpleaños! From the verb venir, the phrase que viene is used to refer to an upcoming day. It’s more or less interchangeable with próximo. The only difference is that in this case, the day of the week comes before the phrase. Vamos a Barcelona el viernes que viene. Use siguiente to talk about a day beyond next week. No empieza el curso el próximo lunes, sino el lunes siguiente. You can also use this word to talk about “the following day,” but in the past. The word siguiente can appear either before or after the day of the week. Dijo que no iba a volver, pero el martes siguiente, allí estaba. To say “last Sunday,” or any day of the week, use the word pasado. Like siguiente, pasado can appear either before or after the day of the week. Either way, make sure not to forget the article el. El sábado pasado, fuimos a la playa. Use anterior to talk about a day further in the past than last week. No la vi el viernes pasado, sino el viernes anterior. This useful little word ought to exist in English! Hoy es jueves, anteayer fue martes. This phrase is just a concise way to talk about two days in the future. Viene mañana, y pasado mañana se va.
Hay siete días en la semana. Although semana is feminine, fin de semana (weekend) is masculine. In the plural form, it’s los fines de semana (weekends). Este fin de semana voy a ver a mis amigas. This word refers to everything that isn’t the weekend, i.e., Monday through Friday. Viajo los fines de semana, pero me quedo en casa entre semana. Use cada to talk about routines that occur every week. With cada, use the singular form of the day of the week and avoid the pronoun el. Cada jueves tengo clase de matemáticas. Todos los literally translates to “all of the,” but when talking about days of the week, use it just as you would say “every” in English. It’s very similar to cada. The only difference is that it’s plural, so you must use the pronoun los and the plural form of the day of the week. Voy al cine todos los viernes. Put a day of the week in the middle of this phrase to refer to a specific day every month. You can also use el segundo (the second), el tercer (the third) and el cuarto (the fourth). Hay una fiesta el primer sábado de junio. Use this phrase to talk about a range of dates. Almost interchangeable with de…a…, you will also hear people using desde (since) and hasta (until) to refer to a range of dates. Estaré en Santo Domingo desde el lunes hasta el sábado. You now have all the tools you need to talk about days of the week in Spanish. Got it down? Next, try out months and time-telling! You’ll be well on your way to having Spanish conversations in no time.